« Signing Pat Jennings and the very unlucky Ryan Garry. Anniversaries 6 August. With the opening of Highbury for the first match of the 1913/14 season, Henry Norris must have been ready to take a breather, and it is interesting to note that in the following months it was William Hall, and not Norris who had the job of carving links between the area’s new residents and the new arrival. This made a lot of sense – Hall was always the diplomat and as the only southern member of the Management Committee of the Football League was now a man who could be seen to speak for the south – as well as a man of significance and influence in footballing circles. Norris was the deal maker – and he had indeed since 1910 made the deals that determined and secured Arsenal’s future. But as the opening matches progressed Norris had another major input on the club, for 20 September 1913 saw the first use of the Latin phrase “Victoria Concordia Crescit” in the club’s programme. Given that Norris was not a man versed in Latin the phrase is likely to have been suggested elsewhere, and it is not impossible that Norris asked the programme editor, and by now highly regarded journalist, George Allison, to find a phrase that symbolised the hard work and dedication that had taken Arsenal to Highbury. 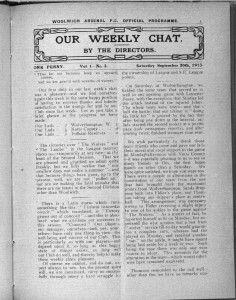 To mark the move and help promote Arsenal’s credentials, a new programme design was also introduced, expanded from 8 to 16 pages and including “Our Weekly Chat by The Directors”. The author was probably Henry Norris, who as we have seen, wrote columns in several local newspapers, and had tried his had at running a magazine to rival the all powerful but northern biased, Athletics News. Obviously the programme at this time, perhaps more than ever, was upbeat. There was a need for the move to be seen positively, of course, but the high crowds and excellent results gave a real feeling that the enormous investment in building the ground, and the simply amazing fact that it had opened in such a short amount of time, meant that there was a buoyancy in the air which had been lacking at Plumstead since the two semi-final appearances of 1906 and 1907. 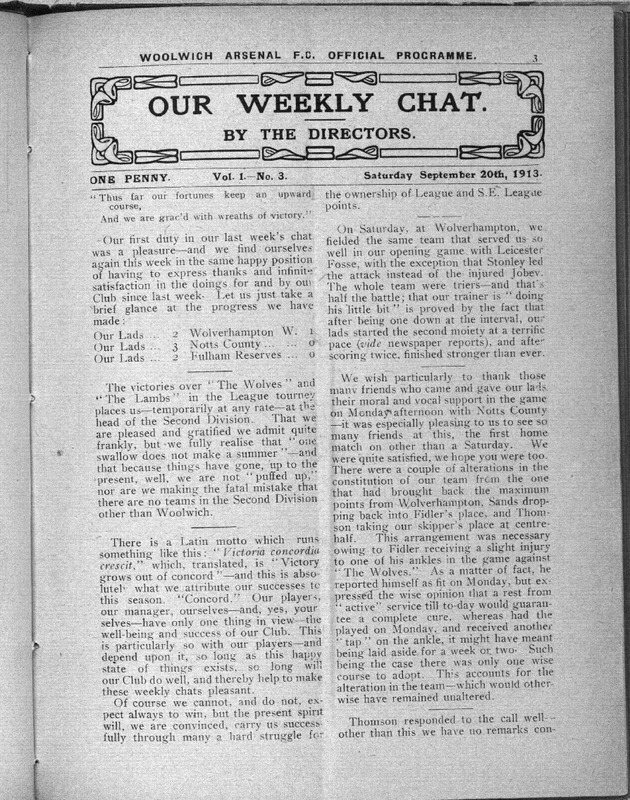 The next match was on 20 September at home to Hull City, and it was in this programme that, as Andy Kelly discovered, the directors of t he club attributed the success of the venture (which we must remember could so readily have failed and cast Arsenal into the wilderness) to “concord” within the club and the Latin motto “Victoria Concordia Crescit” was mentioned for the first time. The relevant page from the programme is shown below (click to enlarge). It was a good comment to throw out towards the Highbury Defence Committee who were still active, but it was also a comment on the success of the venture. It was totally Norris’ idea, but he had shown again his genius for pulling people together and getting them to believe in his notion, and thus far it was looking a success. And we should note that normal footballing matters were continuing. For example on 11 September Arsenal had played an away friendly with QPR using mostly a reserve team which Arsenal won 2-0. But Arsenal also were involved in other competitions including the London Football Association Charity Cup (LFACC) in which Arsenal had competed since 1908. This season the first round was played at Highbury and ended in a 1-1 draw in front of 6000 on 22 September. The replay one week later had a similar sized crowd and ended in a 3-2 win to Arsenal. The defeat to Barnsley was the first defeat of the season, and if this was a sad moment then the news on 30 September 1913 was more upsetting, at least for those who had a feeling for the history of the club. As Mark Andrews reported in an earlier article on this site, although as we have seen alcohol was not on sale within Highbury, as part of the leasing agreement, it was on sale at the Manor Ground throughout the whole time Arsenal were in occupation. 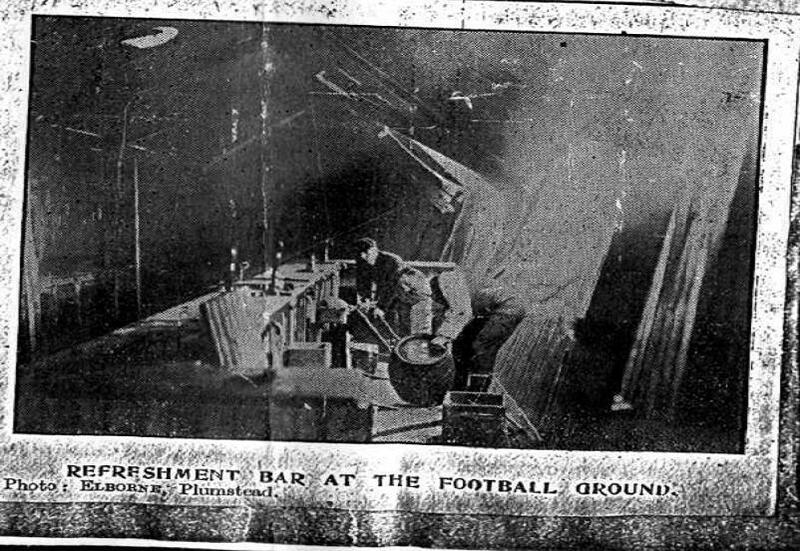 There were indeed numerous “refreshment” bars or stands which “appear to have been dotted around the Manor Ground, and re-positioned or extended over the years, as refurbishments occurred in different areas of the ground,” according to Mark’s account. The Daily News on 12 Feb 1907 reported that the explosion was so powerful that people were woken from their sleep as far afield as Braintree. It appears that this bar was built 3 years earlier as part of the expansion of the Spion Kop as an article in the Woolwich Gazette on 19 August 1904 noted that the architect, Archibald Leitch, was utilising the back of the Abbey Wood End slope for refreshment bars. But now, on 30 Sept 1913 the Woolwich Gazette reported that the whole North Grandstand was gutted by fire which started at the refreshment bar, at the junction with the western end of the stand. “…as full as a sardine box, and after the game had been in progress about 20 minutes, a terrific roar… caused all eyes to turn in the direction of where the refreshment bar once stood. This had disappeared and the swaying crowd alone indicated that something serious had happened”. The worst injury was that one “unfortunate” obtained a broken leg and 2 “fellows” had broken ribs. So it appears these bars were common at grounds and not just at Woolwich. At Arsenal the bars were leased out at least by the time they had gained promotion. It was reported at the AGM of 24 June 1905 that the annual income for the rent of bars, etc… was £110 5sh. It is not clear whether the rental policy was due to the licensing laws or a commercial decision by the club. Here’s the picture of the aftermath. And so the Manor Ground, which was being used by Woolwich FC, an amateur club, had been seriously damaged. It had however never been seen by Henry Norris as a financial asset, and I am not clear if the ground was ever restored, or if this end of the ground was simply closed. 4 October 1913 saw the first league defeat at Highbury. Arsenal 0 Bury 1 in front of the highest crowd so far – 30,000. That may have made the cynics think Arsenal were returning to type, but the next 8 games at Highbury were all home wins – the only other home defeat come against Huddersfield in February. In the next article I shall look at the players who played in these games at the very start of Arsenal’s north London career although it should be mentioned that my earlier comment about Norris taking a back seat for a while was not completely accurate because around this time Woolwich Arsenal Football and Athletic Company prepared a new share issue, (the first since that of December 1910) and the first since the move. These arrangements took a while to set up and shares finally went on sale in December 1913 and 745 new shares were bought, at £1 each, a sizeable contribution to the heavy costs of setting up the new football ground. A second share issue followed, in October-November 1914, an unfortunate bit of timing as crowd levels had already been affected by the outbreak of war; however a further 276 new shares were sold. These events however were not just incidental. Norris had invested a sizeable part of his fortune in the club, and was looking to recover it by selling off the club to investors. It was as a result of this action that thousands of people were able to become shareholders in the club, and make the club an institution which to some degree at least, was owned by its fans. This approach laid down by Norris continued through much of the 20th century and was only finally overturned by the takeover of the club by Kroenke.